I had finally arrived in Colorado, had found some free wifi in Ouray, and spent the night parked (probably illegally) along Sneffels Creek in Yankee Boy Basin. I was there to climb Mt. Sneffels, a 14er and one of the highest summits in the San Juan Mountains, possibly the most rugged range in Colorado. I wasn't sure that my friends who I was to join in Telluride in a few days had any interest in such summits, so I figured I'd go after this one before our get together so I wouldn't have it on the back of my mind the rest of the week. Without a beefier vehicle, I was forced to park at the start of the 4WD road at 10,700ft rather than the easier TH some 1,500ft higher. 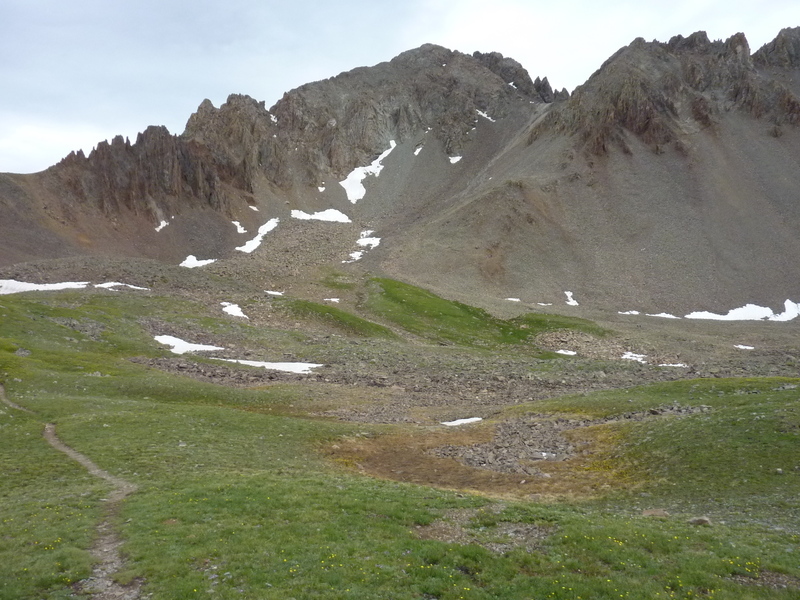 Even with the lower starting point, the distance to Sneffels was only about three and half miles, making it far easier than even the easiest 14er in CA - such is the nature of most 14ers in Colorado. I figured I could do both Sneffels and nearby 13er Gilpin Peak and still have plenty of time left. There were two routes described in Gerry Roach's guidebook accessible from this side of the mountain. I chose to ascend via the harder class 3 SW Ridge and then descend the standard route via Lavender Col.
My 6a start worked nicely for two reasons - it ensured I could hike the 4WD road without being interrupted by the steady stream of vehicles found plying the road later in the morning, as well as getting me off the summit before the rains started. June and July had been unusually wet in Southwest Colorado with a steady series of tropical systems bringing in warm, unstable air from the south and dumping inordinate amounts of rain during the early summer. This made for very green conditions and fantastic flower displays, but also for difficult weather conditions. It was already clouding over as I started and would begin to threaten within the first hour. The sun made a brief appearance shortly after sunrise when it lit up Gilpin for a few minutes before hiding behind the overhead cloud layer. A mile up the road was a disabled Toyota 4Runner resting in the middle of the route, a broken control arm lying detached from the front wheel which was askew. Even beefy vehicles have trouble here, though the stretch of road was not all that rough. At the second mile I reached the junction with the Blue Lakes Trail and followed this up to Blue Lake Pass. The trail is a nice single track that gets one off the Jeep road, passing through fine alpine meadows in the upper portion of Yankee Boy Basin. I passed by Wright Lake near the base of Gilpin Peak, then past another trail junction (a connector trail from the top of the 4WD TH) before reaching the pass. The ridgeline here marks the boundary with the Mt. Sneffels Wilderness that extends into the Blue Lakes area west of the pass. My route took me off the trail and onto the start of Sneffel's SW Ridge. The route turned out to be a good one, and despite my expectations that the class 3 rating might be Colorado soft, I found it to be class 3 even by California standards. A young couple were found on the route not far along, just off the trail. They asked me if they were on the correct route but it seemed more in line with making conversation than any real doubts they harbored. The ridge is not easy to lose and the only real decision point comes after reaching a distinct notch just shy of the halfway point. Here there are use trails seemingly going around both sides of an obstruction but the correct (easier) route appears to be around to the east side following a short downclimb. Ducks lead back up to the ridge proper and from there one simply stays close to the ridgeline until reaching the summit. I had left the other two behind near the notch in order to make swift progress to the summit as light drizzle and some snow flurries had already started to fall. I reached the summit around 8:20a, less than two hours after starting out, finding an ammo register box tucked in the talus about the summit. It was filled with all sorts of loose pages and crammed notebooks, none of them particularly old and I don't think I even bothered to sign in. I snapped some hasty photos looking west, north and east before starting down the east side towards Lavender Col. Clouds were beginning to swirl about the higher elevations, reducing visibility some, but not enough to be of any real concern (besides, the GPSr would have probably gotten me down even in a whiteout). It wasn't obvious where the correct route went down this side of the mountain, or even if there was a correct way. I looked for boot prints in the sand mixed with talus as I descended, moving a little too much to the south and slightly missing the main gully. A traverse back to the north with some easy class 3 downclimbing eventually got me to this gully where I found another couple heading upwards in the diminishing visibility. They seemed competent, or at least confident enough to continue despite a dozen or so other folks having already turned back on the standard route. Once at Lavender Col the descent went easier, down steep class 2 talus and sand, a myriad of use trails converging on a pair of stone cairns marking the upper reach of the trail leading from the 4WD TH. On the way down the trail I passed by some of the others who had turned back earlier. I wondered if this was standard precaution in Colorado's fickle weather, but I certainly don't have enough experience to judge it overly so. It seemed foolhardy to continue with my original plan of heading to Gilpin, now partially bathed in clouds. Instead I set my sights on an easier bonus, nearby Stony Mountain, some 1,000ft lower. It rises prominently at the end of a low ridgeline separating Yankee Boy and Governor Basins. There is a notch in the upper reaches of the ridgeline that I wasn't sure if I could manage, but it seemed worth a try. I left the road/trail system near Wright Lake, heading cross-country to the south to gain the low ridge leading to Stony. It was a delightful romp across verdant green slopes, flowers in abundance and fine views around Yankee Boy Basin, despite the continuing threat from the weather. I was perhaps 10min from finding my way to the uncertain notch when the rain decided to come down more steadily and it did not take long for me to get wet despite a rain jacket and pack cover. My boots were soon as wet as the rocks and grasses and I deemed it unwise to continue onto Stony Mtn. I dropped north off the ridge, making a beeline for the 4WD road and my swiftest route back to the van. Back on the road I met up with the circus that is the OHV crowds out of Ouray. There are three types found all over the basins here - those that ride along as passengers on guided tours, those that rent Jeeps back in Ouray, and those that bring their own vehicles. Late morning was one of the busiest times for touring and with the wet weather bringing slick conditions it was not surprising that traffic jams might result. I jogged down past the idled Jeeps and SUVs, adding to the spectacle that had replaced sightseeing momentarily. I'd move off to the side to let vehicles pass, then back on the road as they ground to a halt at another problem section. The result was that the OHVs proved no faster than the human foot, but they certainly kept their occupants drier. It was 10:45a before I got back to the van and out of my soaking wet boots, socks, and pants. I was a little concerned that the continuing rain might make for muddy conditions on the road for which my van would be no match, so I wasted little time in getting back on the road and down to Ouray. I had spare pants and boots and was soon comfortably nestled away in an Ouray ice cream shop with free wifi. The weather improved around noon and my restlessness soon got the better of me - I had hours and hours of daylight left and needed to get back out to the hills. I hit upon a trio of 12ers east of Red Mountain Pass, about 10mi south of Ouray. They looked like they'd make for a nice ridge walk to connect them. The road from Ouray to Red Mountain Pass is extremely winding and narrow as it climbs through the Umcompahgre Gorge. It was originally built by Otto Mears in 1883 and was known as the "Million Dollar Highway", a moniker it still carries. Just south of the pass is dirt County Rd 14 which offers access to points east of the pass. I drove about half a mile up this road until it became too rough for the van, parking off the side where another vehicle had been left. A north fork here is closed to motor vehicles but open to bike and foot traffic. The south fork, the continuation of County Rd 14, is open to all traffic. As I started up the former, a line of some 6-7 Jeeps came slowly down the latter fork. Though steep, the road wasn't in bad shape and my guess is the slow speed was to keep the dust down. My first stop was Red Mountain No. 3. It is the highest of three similarly named Red Mountains (No. 1 & No. 2, as you already guessed). These brightly colored mountains were the site of much mining activity 130 years ago when Ironton and Silverton were in their heydey and tens of thousands of inhabitants were found in the small collection of mining towns. Almost all of the mining activity has ceased thanks to off-shoring, but some of the towns like Ouray, Telluride and Silverton survive as tourist destinations. Some of the old mine works are evident on the hike up to Red Mtn #3, but mostly things are quiet and green and far more pleasant now. A gated road leads to the bare summit, mostly a pile of talus for the last 300ft or so. There are fine views to the line of 13ers dividing Telluride from Red Mtn Pass, though the clouds today kept some of these hidden. At least the rain had stopped and light winds had dried out the alpine meadows. I spent about an hour hiking the ridgeline between Red Mtn #3 and McMillan Peak to the south, a very pleasant stroll across verdant fields of flowers and grasses. There are two summits to McMillan, the west being easier to reach but the east one, just off the main crest, appearing higher. Atop McMillan's east summit is found what looks like a drive-in movie screen but more likely some sort of communications repeater. A glass jar held a summit register that didn't date back very far. To the south, tucked in the canyons east of the crest can be seen (just barely) the town of Silverton. I had been there once before with my kids some years ago when we took the train from Durango to reach it.